In a recent post the way in which Leonard Schwartz’ “IsoTonoMetrics” related to Charles Atlas and Dynamic Tension was mentioned. Since then, some new information has come to light from Dr. Schwartz’ “Fitness Method” patent that is worth sharing on this topic, especially if people want to understand the inner dynamics of Schwartz’ “IsoTonoMetrics” and practice it for themselves. Remember that in Schwartz’ IsoTonoMetrics, the hands are clasped or otherwise pushing together or pulling apart in various ranges of motion to activate different upper body muscles. Bends, knee dips, torso twists, steps, head and neck rotations, various dance like moves, lunges, posture changes, body positions and toe raises are used to create a “whole body” aerobic exercise. Here is an interesting note where at times (aside from the legs and torso moving at the same time), “IsoTonoMetrics” begins to look more like Charles Atlas’ “Dynamic Tension”… as the speed of the upper body motion moves from fast to relatively slow like a well performed “Dynamic Tension” movement designed to build muscle and strength. With HeavyHands, Schwartz was known for fast moves… over 100 strokes per minute with the light weights. With IsoTonoMetrics and body weight exercises on his “Pan-X” device he began talking more about “slowaerobics”, i.e. how total body exercise involving more than just the legs as primary aerobic drivers could, at speeds much lower than running speed, still produce high oxygen usage. Do the math, add the 65% of your muscle mass above the waist to the exercise. You could reduce the speed of leg movement (go from running to walking or simply flexing legs in a wide stance) and add upper body ISO moves. The total combination of muscle mass, ISO resistance movement, range of motion can add up to something the average exerciser could do for an hour – burning as many or more calories than the speedy runner burned in the same hour – a the while gaining MORE fitness factors, for more parts of the body with REDUCED chance of injury. His motto for “Iso” was also to never build strength without building endurance and never train for endurance without also building strength. The speed and isometric-like force generation of the hand coupling can also vary during the fitness method routine. For example, the hand coupling could be rapidly moved through space for 5-10 repetitive sequences followed by 5-10 sequences at a slower speed. Slow movements favor the strength component of the fitness method, but without totally neglecting the endurance factor. Fast movements favor the aerobic component of the method. Schwartz was envisioning a portion of every workout and every overall move devoted to higher tension repetitions to build “the strength component of the fitness method, but without totally neglecting the endurance factor.” That’s why the previous post noted that, except for the fact that Schwartz’ “Iso” combines upper and lower body moves at the same time, as the movements go slow to generate high force, the exercises could increasingly look (and produce results) similar to Charles Atlas’ “Dynamic Tension” method because Schwartz came to share Atlas’ overall “fitness ideal” of strength and endurance. A student of the Atlas Course would be well versed in the basic types of moves required to perform Schwartz’ “ISO” as a result of the Atlas course! The student would only have to learn to combine upper and lower body movements and “mix” the intensity levels of the moves so that the exercises could be carried out for a sufficient length of time to produce an aerobic effect. The main difference between the two systems – other than the combined upper and lower body moves – would be the tendency of Schwartz’ IsoTonoMetrics to have the body bending the trunk as part of the move and working with arms in a circular fashion over, in front of, and behind the head at different times. Atlas himself enjoyed beach running all his life. He recognized that total fitness involves strength and endurance. He simply never combined the two elements into one exercise style. But Atlas and Schwartz both recognized the need for multi-dimensional fitness which included strength as well as endurance. 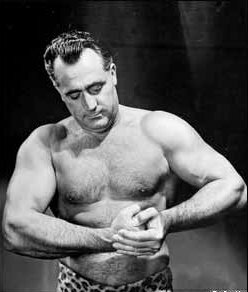 Schwartz also came to value equipment free training, and so, perhaps, it is no wonder his methods might resemble Charles Atlas!